Sent on a 2-3 working day carrier!! 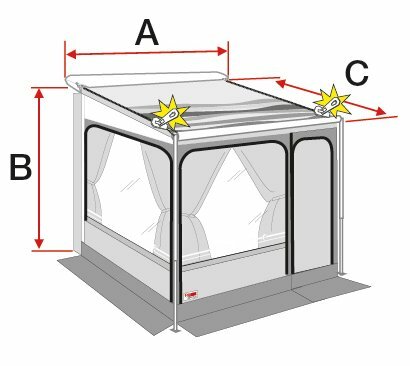 Fiamma Caravanstore Zip XL Awning and Privacy Room. The Caravanstore ZIP XL is the latest Fiamma have to offer with more extension, more living space and more comfort. The Caravanstore Zip XL canopy and privacy easilly join together with Fiamma's sturdy zips allowing for a fast installation. More space with more light! The Fiamma Caravanstore Zip XL not only benefits from the additional extension compared to the previous Caravanstore Zip, it also benefits from the increased size of the side panels allowing for larger open-able windows with built in mosquito nets providing plenty of light and ventilation on those sunny days and an interchangeable front panel giving the option of positioning the door left or right. 1x storage bag Mega Bag dim. 140x27x40cm. • 1x storage bag Mega Bag dim. 140x27x40cm.